Ok thought i would join and write a Scrapebox review since it was this forum where i saw the link to this tool. My short Scrapebox review is this is a freakin kickass, badass tool i am totally blown away. Every time i start it i'm blown away, this is the ultimate backlink tool ever.. and im talking better than Xrumer! I have bought 3 other mass blog commenters, and they are Buggy TOYS compared to Scrapebox. I have owned Xrumer for a few year, and you submit 1 million link blast and you do NOT get many backlinks from it compared to Scrapebox. 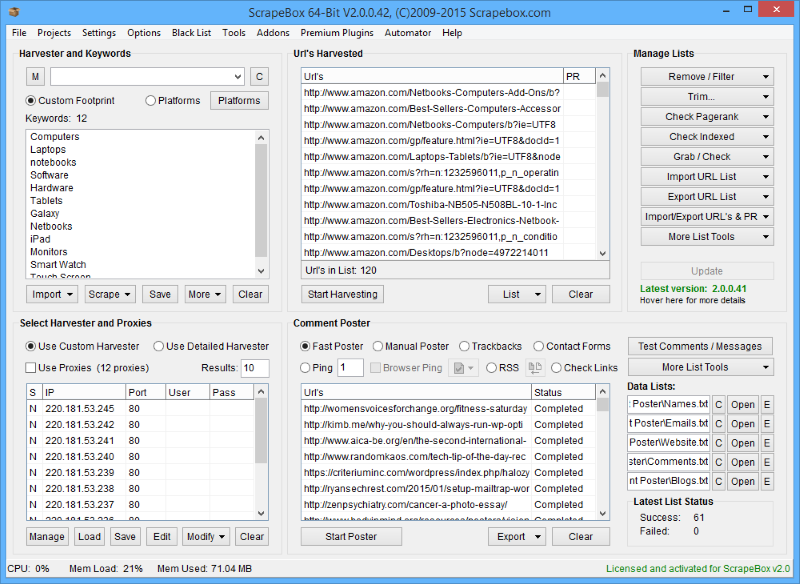 With Scrapebox i can get more links, faster, cheaper and easier. My keyword "Online Games" i was ranking 154 before Scrapebox blasting, and now i am in the top #20 BEATING games.yahoo.com haha! With Scrapebox i got 40,000 backlink in 3 weeks.. What tool can beat that? None! Also Scrapebox will harvest proxies and check them, scrape emails, do bulk pagerank, Trackback spam, do RSS Submit, Backlink Checker, scrape URL's from Google, Yahoo, Bing and AOL, generate fake names, Google suggest scraper to get keyword and many more things. Way too cheap since my site is now earning 3 times than before Scrapebox.. I had a MERRY XMAS! Thats beautiful tool. Thanks admin here and i hope you dont mind me posting my Scrapebox review here, but it was your site which made me find this beautiful tool!